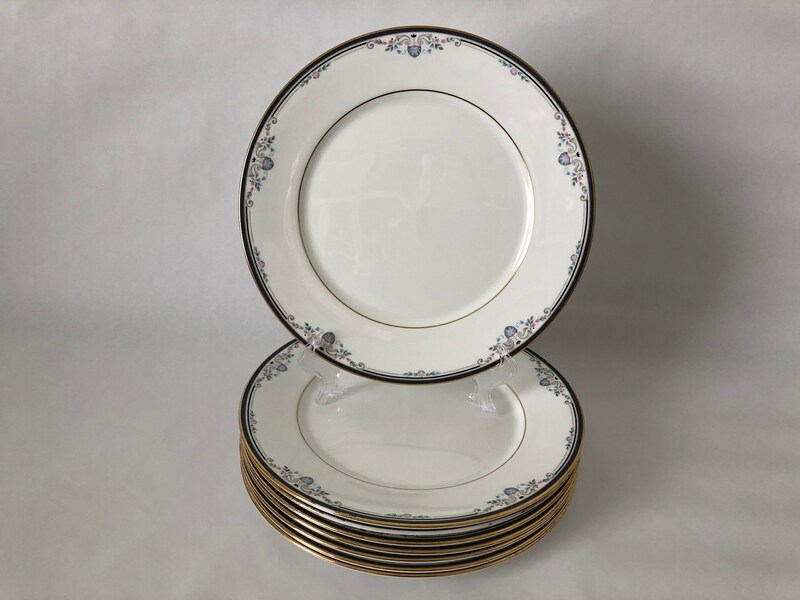 The Sabrina pattern of these 2 sets of 4 Lenox bread and butter plates was produced for 4 years between 1991-95, and is a classical looking pattern featuring a midnight blue band with blue shell designs with pink shading and gray scroll work. These plates ad elegance to a table setting, but can be dressed up or down depending on the accessory dishes, glassware, flatware and linens you choose to use with them. Each plate measures 6 1/2" wide, and all 8 of the plates are in first quality condition with no scratches, flaws, or losses to the gold edging. The companion pieces of this dish pattern that are listed separately, some in first quality condition and some with varying losses to the gold edging that still create a nice table when the qualities are combined (see photo) Overall the dishes I am offering in this very attractive Sabrina pattern offer a great opportunity to own and use some high quality porcelain at a great low price. The shipping cost for each set of reflects the weight of these plates, however if you combine this item with another for an order totaling a minimum of $50 at this shop shipping is free.